Fall harvest is when corn farmers reap the rewards of their hard work. It’s also when they face major variability in environmental conditions — and potential yield loss — as they race against the clock to get the crop in the bin. Time is of the essence during harvest, with a crop at maturity and variability in weather conditions that can range from heat and humidity to wind and snow. Making sure your crop gets harvested in optimal time takes planning, accounting for potential roadblocks from Mother Nature, and employing the right equipment, says Fenton, Iowa, farmer and Dragotec USA president Dennis Bollig. Shelling loss and ear bounce are common ways to lose yield at harvest during moisture extremes. It’s important to find the “sweet spot” for crop moisture at harvest. “Delaying harvest until corn dries to 15 to 20% will save considerable artificial drying costs,” according to a report from Iowa State University Extension agronomist Roger Elmore1. Elmore says the general weather conditions immediately preceding harvest can give you a good idea of how drydown is progressing. As a rule of thumb, corn at maturity is around 30% moisture, and depending on the weather conditions, it typically takes at least two weeks to dry down to 20% moisture. Though modern corn genetics help the crop stand better in the field longer, once it’s reached maturity, deterioration begins. And, when stalks start to deteriorate, yield loss potential grows quickly. Balancing the right crop moisture levels with potential deterioration can be difficult, but it can make all the difference in minimizing yield loss, Elmore adds. 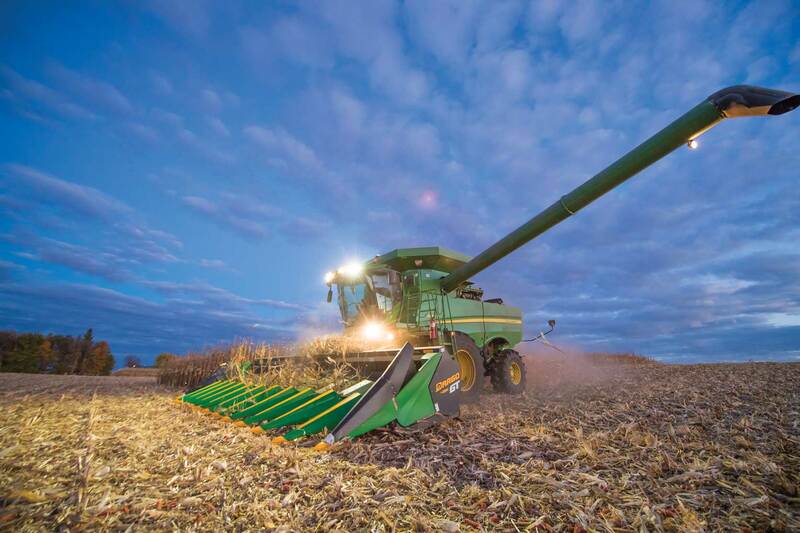 Though you can typically track drydown to the optimal point at harvest, Bollig says it’s important to stay vigilant and react to sudden changes in field moisture conditions that can lead to greater crop deterioration. The exact time to harvest each field should be based on production history, weather conditions and crop varieties. But, having the right equipment can help you react to the variability and challenges common at harvest time.